Well-maintained playgrounds reduce the severity and number of children’s injuries. The goal of the PMT is to make playgrounds safer places for children’s active play and healthy risk-taking. For nearly a decade, the comprehensive Playground Maintenance Technician program has trained over 2,000 participants in nearly 20 states and internationally. The PMT focuses on practical playground maintenance practices, inspection principles and best practices in making repairs. This two-day program does not focus on play theory or memorizing standards. Course modules explore the maintenance challenges associated with the common materials found in playgrounds. Through videos and case studies, participants learn about the types of playground inspections, how to repair damaged equipment and associated legal considerations. A virtual playground offers participants the opportunity to apply newly learned skills. What existing KNOWLEDGE do I have about the equipment? Learn about common problems with equipment and surfacing. As a group, practice where to look for problems and prevent future issues. What CORRECTIVE ACTION needs to be taken? Discuss ways of preventing hazards during the maintenance process and how to correct common issues. Use inspection forms to practice documenting repairs. What makes the PMT different from other programs? 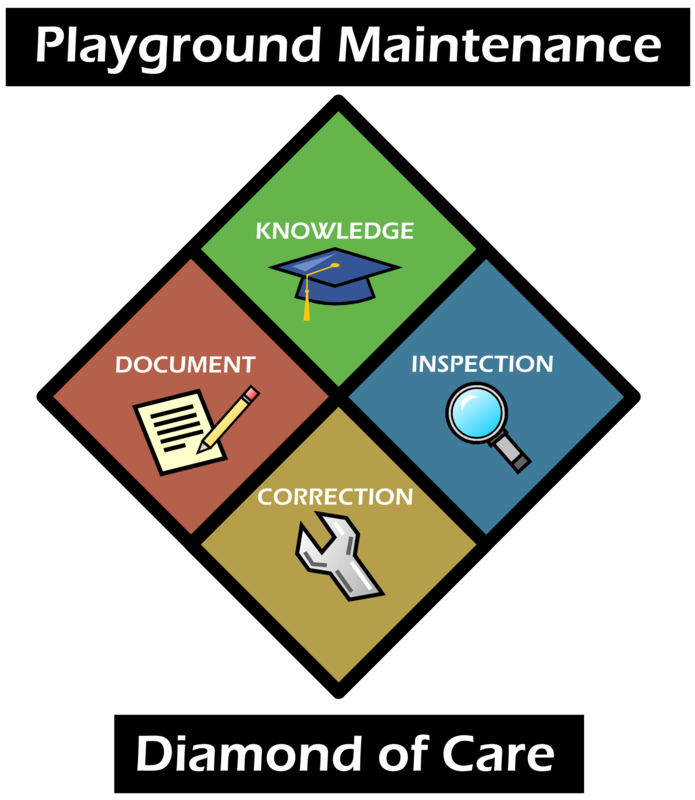 What is the difference between the Playground Maintenance Technician Program and other national playground safety classes? Another distinctive feature of the Playground Maintenance Technician Program is the use of a virtual playground setting to help participants learn more effectively by bringing the playground into the classroom. This instructional tool helps participants to learn within a virtual playground setting to actively identify hazards and address maintenance concerns. Anyone who performs hands-on playground safety inspections and maintenance, along with those who supervise playground maintenance staff should attend the Playground Maintenance Technician Program. Participants with experience ranging from just a few weeks up to 30 years, find the two-day course practical and informative. How long is the PMT? How long is the Playground Maintenance Technician Program? The program lasts approximately two days and does not require any class or test preparation. Do I have to recertify with this program? No. This is a “certificate of completion” program. There is currently no recertification requirement. After finishing the program participants receive a certificate of completion and 1.3 CEUs (13 hours of participation). No. This is a certificate-of-completion program. There is currently no recertification requirement. What does the PMT cost? Host Option: Program costs include materials, shipping, instructor fees, instructor travel, and administrative costs. The total cost of the two-day program is $8,000 for 25 participants. Additional costs per person, up to 45 total participants, is $125 per person. A $1,500 retainer fee is required 6 weeks prior to the training. Note: A minimum of 25 participants must be enrolled 4 weeks prior to the training date. Partner Option: Eppley Institute charges $340 per person, which covers all costs (registration management, catering fees, materials, shipping, instructor fees, instructor travel, and administrative costs). There is no retainer fee with the partner option. Note: A minimum of 30 participants must be enrolled 4 weeks prior to the training date. What does a PMT schedule look like? Work with the Eppley Institute for Parks and Public Lands at Indiana University to schedule a Playground Maintenance Technician training program in your area. The Eppley Institute will make sure your agency has the tools to make the training a success. The Eppley Institute understands it can be difficult to secure the support and commitment for a training opportunity. We offer a host option, where the cost per person is less, but your agency is responsible for registration, catering, and other logistics. The partner option is more per person, but the Eppley Institute is responsible for most logistical items. (See What does the PMT Cost). Additionally, many host sites seek successful sponsorships from insurance representatives, playground equipment and surfacing companies, or local foundations and associations to defray program costs. How did you hear about PMT?